The ultimate survival storm tactic, jogging into breaking seas, has had its first (and hopefully last) FPB test. This took place recently off the Needles near the Isle of Wight in the UK’s Solent. There is some fascinating video taken aboard FPB 64-6 Grey Wolf in tide against wind generated breaking seas (overfalls), with the stabilizers off, to which there is a link at the end of this post. There are all kinds of tradeoffs in yacht design. One of the most difficult to get right is the relationship between hull shape at the waterline and further up the topsides. If you are too fat at the waterline, the boat pitches and rolls uncomfortably. If you are too skinny, then a variety of unhappy things may occur. When you are going downhill at speed, more volume in the ends is desirable. Heading into the waves the opposite is the case, until you encounter large, breaking seas, in which case you need sufficient volume above the waterline so that the bow lifts to the oncoming wave. Of course too much lift and a dreadful pitching or hobby horsing ensues with a substantial reduction in speed. We know from long experience that the FPB Series have their act together running downwind at speed. To date, in multiple ocean crossings and several hundred thousand sea miles, no FPB has run out of steering control downwind. We can also say that the FPBs have done pretty well uphill, although the usual approach is to try and avoid this sea state. What might or might not be possible to deal with has been open to conjecture. But with this experience off the Needles we have a much better feeling for what could be possible in a survival sea state. The video below was taken in in a southwesterly gale, blowing against an ebbing tidal current, in shallow water, outside the marked channel off the Isle of Wight. The closely spaced breaking seas are similar to the breakers on top of larger waves in open ocean storms. This entry was posted on Tuesday, December 2nd, 2014 at 12:33 pm and is filed under Cruiser's Tech Talk, Dashew Logs, four, FPB 64, FPB 64 Passages, FPB 64 Updates, FPB 64 Videos, Storm Tactics, The Logs, Weather. Both comments and pings are currently closed. Thank you Peter Watson and crew and Steve for this video. This is what I have been needing to see from the world of FPBs. Any future such videos would be great to see. Thank you for sharing – a great confidence builder. How do you think Grey Wolf would behave if she would be running off in these conditions? 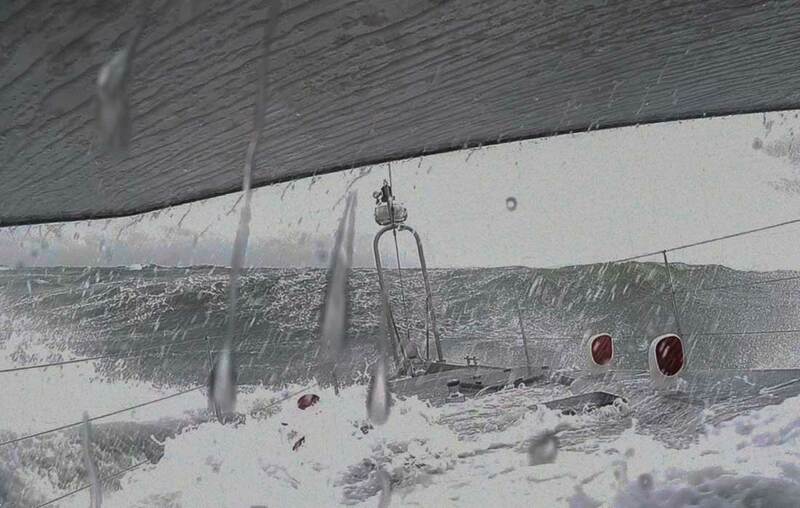 The FPB 64 would be very happy surfing in the Needles type conditions. However, if those waves were on top of large seas, say 40′ combined, you might want to turn and head into them. It is a question of wave shape, and the risk from crossing seas. Great Design/Build.! Very cool to see real world big waves & your boats just blasting up hill in control.! Comfortable ride considering the sea state. Reminds me of Cook Inlet. Thanks for sharing. Impressive. How did the dorades cope or were the vents shut? The Dorades were closed when Grey Wolf took her shortcut. At what point would you deploy the drogue and continue to head downhill? When to use the drogue on the FPB series is a difficult question. The simple answer is when you begin to run out of steering control and want or need to continue downhill. This would typically be if there was a tropical system chasing you and the safest course weather wise was running off. Or perhaps a larger system with a dangerous core – think baroclinic storm structure – required moving the boat downwind and away from the developing system. Never having run out of steering control on any of our personal yachts, we carry a Galerider for that extremely low probability event, which has yet to befall us. Hopefully boat speed, watching the weather, and good control will keep this a theoretical discussion. If the situation deteriorated markedly would it be sensible to pull speed back, equivalent to heaving to, particularly if the downwind option was problematic? why were the stabilisers off? It is a long story as to why the stabilizers were off. Suffice it to say, this gave us some incredibly valuable information. Take for example roll period in that “interesting” sea state. With the stabs out of the equation we can see how the dynamic period compares with the calculated values, and from the crew advise on how things felt comfort wise. Check out the very fast rolls when the equilibrium is upset by the steep seas off the starboard bow. The faster the roll period, the better the ultimate stability, and the ability to recover from a capsize. Another interesting item is whether or not absent active stabilizers if a rhythmic rolling would set in and how long it would take for the roll to die off. A very long answer, and not a direct one to why the stabs were off. More on that at a later date. I am wondering about position with stabs off and failure mode. In other words, it seems they were turned off purposely here. So is there a locking pin or something to keep them centered? And what is centered? Angle of attack such that lift is neutral when trimmed the DLW? What then happens if there is a failure in this condition? Do they automatically center themselves with some kind of detent or hydraulic brake perhaps? Of course they are going to provide some stability in the neutral position just as a bilge keel would. I think I read somewhere that for faster boats — when operational — they lock out above a certain speed. Different sizes of NAIAD stabs have different locking systems. For example, the units on Wind Horse and the FPB 64s have a toggle that is locked with a pin, so alignmeny has tpbe precise. The larger systems on the FPB 97 and FPB 78 have bolts which are wound into position. As to AOA, the optimum neutral angle of attack is a complex question, and one which is not easily answered. Boundary layer and waterflow streamlines are a guess, not to mentionthe tolerance issues with how the fins are installed onto their shafts. Angle of attack is reduced by the software as speed increases. Look foorward to meeting, Dennis. We just have a 48 Tolly which is perfect of the PNW (for now). A 64 FPB is on the dream sheet. Hello, I thought I would add my perspective as an experienced Master Mariner with a decade on the North Sea in small coasters, and tugboat experience in the Pacific North West. Your yacht does just fine. The water on deck is NOTHING to worry about (in this sea state) The sea state here was actually quite mild, with just a bit of a sea running, maybe 5 foot max. You could run all day in this. However, in serious heavy heavy weather your yacht would need to SLOW down to avoid diving too deeply into waves, and it would DEFINITELY need windows covers with heavy boarding seas. No matter how strong the window, one broken window would be catastrophic, as it would lead to downflooding. Lovely yachts. Keep building them. Thanks for the input. The seas were averaging a touch more than five feet, with the largest seven to ten feet. The bow of the FPB 64 is around 6.5’/2m off the water. We agree there comes a point where it is better to slow down. However, in 250,000+ miles including a number of trips across the Gulf Stream, we have not seen conditions where this would be required due to solid water on deck. The FPBs are relativley light compared to most ocean capable vessels, with a long, lean bow that will drive through a five foot wave, but tends to lift in steeper seas. The very fine lines aft reduce the tendency for the passing wave to lift the stern up and force the bow down, as you would normally find. The net result is that so far we have not had much solid water on the windows.